TIP: To quickly find employee time cards, type your card form number in the Search Box (upper right corner) and click GO! 10-800292 Time Cards (box of 1000) for righthand side printing Time Clocks. 1st Day - 7th Day, 3 1/2" x 9", 1 Side Green Ink. 10-800762 Time Cards (box of 1000) for righthand side printing Time Clocks. Front: 1st Day - 7th Day, Back: Over and Extra Time, 3 1/2" x 9", 2 Side Green Ink. 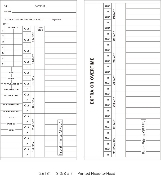 1900L Time Cards (box of 1000) for righthand side printing Time Clocks. 1st Day - 7th Day, 3 1/2" x 9", 1 Side Green Ink. 1900L2 Time Cards (box of 1000) for righthand side printing Time Clocks. 1st Day - 7th Day, 3 1/2" x 9", 2 Sides Green Ink (front) and Red Ink (back). 1902L Time Cards (box of 1000) for lefthand side printing Time Clocks. Daily Time Card, 4 3/16" x 7", 1 Side Green Ink. 1903L Time Cards (box of 1000) for lefthand side printing Time Clocks. Weekly/Bi-Weekly Time Card, 3 3/8" x 9", 2 Sides Green Ink (front) and Red Ink (back). 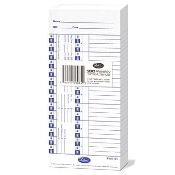 25131 Time Cards (box of 1000) for righthand side printing Time Clocks. Front: 1st Day - 6th Day, Back: 7th Day or Over and Extra Time, 3 3/8" x 7", 2 Side Green Ink. 25550 Time Cards (box of 1000) for righthand side printing Time Clocks. Daily Cost Card, 4 3/16" x 9", 1 Side Green Ink. 33 Time Cards (box of 1000) for right-hand side printing Time Clocks. Monday - Sunday, 3 1/2" x 9", 1 Side Green Ink. 33-2 Time Cards (box of 1000) for righthand side printing Time Clocks. Weekly/Bi-Weekly Monday - Sunday, 3 1/2" x 9", 2 Sides Green Ink (front) and Red Ink (back). 800762 Time Cards (box of 1000) for righthand side printing Time Clocks. Front: 1st Day - 7th Day, Back: Over and Extra Time, 3 1/2" x 9", 2 Side Green Ink. For right hand side printing Time Clocks. Front: Friday - Thursday, Regular Hours, Break Hours, and Over or Extra Time (Green Ink). Back: Same as Front (Red Ink). K14-00 Time Cards (box of 1000) for right-hand side printing Time Clocks. Weekly/Bi-Weekly Monday – Sunday, 3 3/8" x 9", 2 Sides Green Ink (front and back). 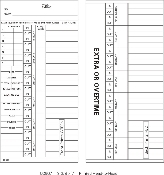 K14-14 Time Cards (box of 1000) for right-hand side printing Time Clocks. First Day - Sunday, 3 3/8" x 8 1/4", 2 Sides Green Ink (front) and Red Ink (back). 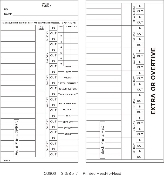 K14-15 Time Cards (box of 1000) for right-hand side printing Time Clocks. Monday - Sunday, 3 3/8" x 8 1/4", 2 Sides Green Ink (front) and Red Ink (back). K14-15B Time Cards - Blue (box of 1000) for right-hand side printing Time Clocks. Monday - Sunday, 3 3/8" x 8 1/4", 2 Sides Green Ink (front) and Red Ink (back). K14-15G Time Cards – Green (box of 1000) for right-hand side printing Time Clocks. Monday - Sunday, 3 3/8" x 8 1/4", 2 Sides Green Ink (front) and Red Ink (back). K1400/4070 Time Cards (box of 1000) for righthand side printing Time Clocks. Front: Monday - Sunday, Back: Form 4070 Employee Tip Reporting, 3 3/8" x 9", 2 Side Green Ink.